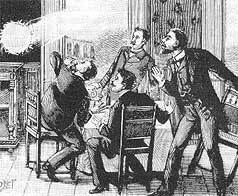 Ball lightning is described as a luminous sphere which seems to appear out of nowhere and vanish into thin air. A typical ball is said to be 4 1⁄2 to 9 inches in diameter (with a maximum range between about half an inch and three feet) It may have a halo around it, emit sparks or rays, and remain visible for several minutes before disappearing, either suddenly in an explosion or by gradually fading away. In some cases, there are said to be odors associated with ball lightning resembling ozone, burning sulfur, or nitrogen oxide, occasionally with the presence of a faint mist or residue. Rarely do the objects cause significant damage. This prompts the question of whether the balls are indeed some kind of by-product of electrical activity in the atmosphere or have a more exotic origin. People have reported seeing ball lightning for hundreds of years. Depending on the report, ball lightning can move upwards as well as downwards, sideways, or in odd trajectories such as rocking from side to side like a falling leaf. It can move with or against the wind, or simply hover, more or less stationary in the air. These balls have been seen suddenly materializing either indoors or outdoors. They have a curious ability to navigate around obstacles, although some balls show an affinity for metal objects and may move along conductors such as wires or metal fences as if they were rails. Others appear to be able to pass, ghost-like, through closed doors and windows with ease. Among their favorite reported haunts are chimneys, fireplaces, and stoves. Sometimes they are described as being attracted to houses, cars, persons, and other objects. These balls are reportedly repelled and unaffected by objects. Some accounts claim the balls have passed freely through solid masses, such as wood or metal, without any effect on the ball or material, while other accounts report damage to the material, such as melting or burning. Some reports suggest an attraction to, or even an origination from electric power lines. Ball lightning has been reported as being seen in various colors as well as having a transparent or translucent look. The most commonly reported colors are red, orange, yellow, blue or white, with about the brightness of a domestic electric light. They are sometimes said to contain radial filaments or sparks while others are evenly lit, and some have flames protruding from the ball surface. They have been reported during thunderstorms, sometimes following a lightning flash, while others appear during calm weather with no storms in the vicinity.